"Ms. Harris has been an invaluable community organizer and a well-regarded legislator. Especially given that background, we are disappointed that Ms. Harris was indicted," her attorneys Joel Cohen and Jerry Goldfeder said in a statement. They added that she has pleaded not guilty and that the indictment does not relate to her conduct in office. As part of the scheme, prosecutors and FBI agents said she claimed the storm forced her out of her home by Sandy and into a rental on Staten Island, only to pocket $24,800 in housing payments from FEMA while living in her Brooklyn home, from 2012 to 2014. She also lied on a NYC Build it Back assistance application about living at the first-floor Staten Island apartment and submitted a forged lease and rental receipts, according to the indictment. New York Assemblywoman Pamela Harris was arrested Tuesday after it was alleged she stole tens of thousands in city and state funds, officials said. Melissa Russo reports. 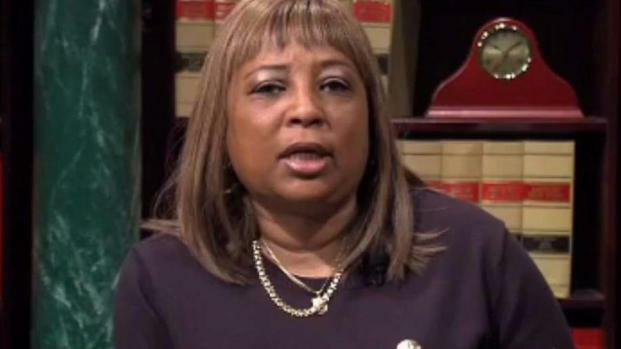 "Both before and during her tenure as a public servant, as alleged, Assemblywoman Pamela Harris went to great lengths to defraud local and federal agencies out of thousands of dollars,” said William Sweeney, the FBI's assistant director-in-charge. He added, "In fact, at a time when many residents in her district were dealing with the horrific aftermath of Hurricane Sandy, Harris was busy brewing a storm of her own, one that resulted in her receiving significant payouts by the very federal agency charged with helping those truly in need." The indictment states that she also lied about the payments and claimed the landlord at the Staten Island apartment was giving her $1,200 in monthly rental assistance while under oath during a bankruptcy hearing in 2013. The 57-year-old is also accused of stealing more than $30,000 from New York City council between 2013 and 2015 while serving as the executive director of Coney Island Generation Gap, a nonprofit also known as CIGG that aimed at mentoring low- and moderate-income children interested in media arts. According to the indictment, Harris funneled money given to the nonprofit meant to rent a studio space to her own personal bank accounts. And in 2015, she withdrew $22,800 directly from CIGG's bank account and deposited into her personal checking account. Then, authorities said, she used the money to buy plane and cruise tickets for her and her spouse, pay her mortgage and make online purchases at Kohl's and Victoria's Secret. According to the indictment, when Harris found out she was being investigated, she asked witnesses in the alleged schemes to lie for her. "When she learned that law enforcement was investigating her various fraud schemes, she pressured witnesses to lie to the FBI and cover them up," said Richard Donoghue, the U.S. Attorney for the Eastern District of New York, which is investigating the case. "This Office and our law enforcement partners are committed to ensuring that those who serve the public are held accountable under the law to the same extent as the people they are privileged to serve." Harris -- who represents Bay Ridge, Coney Island, Dyker Heights and parts of other nearby neighborhoods -- faces up to 30 years behind bars if convicted of the top charge, related to making false statements to FEMA. According to her biography on the Assembly's website, Harris is described as a "vocal advocate for (Sandy) relief efforts and previously helped by personally delivering food, clothes and blankets for her displaced neighbors." She's also spoken about the storm and rebuilding efforts in open and recorded State Assembly hearings. She had been expected in Albany on Tuesday, the third day of the 2018 legislative session. Many lawmakers first learned about her indictment when they arrived at the state Capitol on Tuesday morning. "We are just hearing of this. They are very serious changes, and it's important to let the justice system take its course," said Mike Whyland, a spokesman for Democratic Speaker Carl Heastie, of the Bronx. More than 30 lawmakers have left office since 2000 following allegations of corruption or ethical wrongdoing, prompting regular calls for tougher ethics rules in state government. Term limits and new restrictions on campaign contributions and income from side jobs have all been proposed and are likely to be debated again this year, though lawmakers have shown little interest in ambitious reform. "I'm actually very disheartened to hear that," Senate Leader John Flanagan, R-Long Island, said after learning about Harris' indictment. "That's not good for anyone."